I walked away from this session with a lump in my throat and joy in my heart! It was such a beautiful proposal! Barrett contacted me weeks before the proposal and we emailed back and forth about his plan for the big day. We discussed parking arrangements, details of where I will be, etc. and had everything planned out! Of course, the weather had other plans for us. It started raining on my way to this session and the planner in me was freaking out! I knew that this plan of ours could be ruined by the rain. I mean, if my boyfriend was telling me we were going on a walk and it was pouring rain, I think I would be fighting back a little. I’d probably say, “ummm… let’s take a rain check? Literally".” Barrett said that he was doing this rain or shine and that Jenna is so down-to-earth and it wouldn’t bother her! So, we stuck with the plan! The weather held off until the minute he got down on one knee and the sky starting sprinkling a little. It was actually pretty magical. A little bit after Barrett asked the important question, Jenna looked at me and said, “wait, what hand does the ring go on?! I can’t think right now!! !” We were dying laughing. She was so caught off guard and overwhelmed and it was so sweet! Barrett and Jenna, I wish a lifetime of love and happiness for you guys and am so thankful that I got to be a little part of your next journey in life together! When a client inquires about a proposal session, I cannot help but jump around in my seat with excitement!! This wonderful couple lives in NYC and were visiting Austin for the first time on a weekend trip. 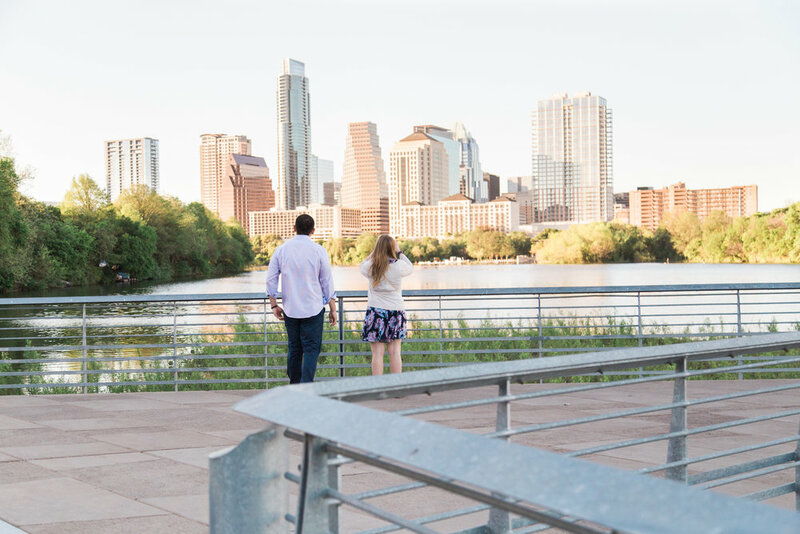 When Cong reached out to me, he said he wanted the perfect backdrop to propose to in Austin, so we chose the Town Lake (Lady Bird Lake) Boardwalk with it's skyline views. I'm sorry, as an original Austinite, I just don't think it will ever be Lady Bird Lake in my vocabulary. Since he was from NYC, we had to do a lot of planning via phone, text, and email, but it all paid off because the proposal went off without a hitch! I was hiding on the boardwalk "taking pictures of the skyline" when they walked up into my frame. Cong's soon-to-be fiancé took a picture on her iPhone of the skyline and then started walking away...that is, until he told her something along the lines of "I have a surprise for you..." She spotted my camera and then a second later, Cong was down on one knee in front of her. I'd say that she was completely caught off guard! A few moments after the proposal happened, Ali's phone rang and it was her mom calling! As she looked at the new sparkly ring on her finger, she said into the phone, "MOM! Cong just proposed!!" This was a special moment to witness and capture with my camera! After they shared the good news, we took a few more pictures and then they went on their way to a nice dinner to celebrate! Cong and Ali, congratulations again! I am so excited for you two and wish you a beautiful life together! 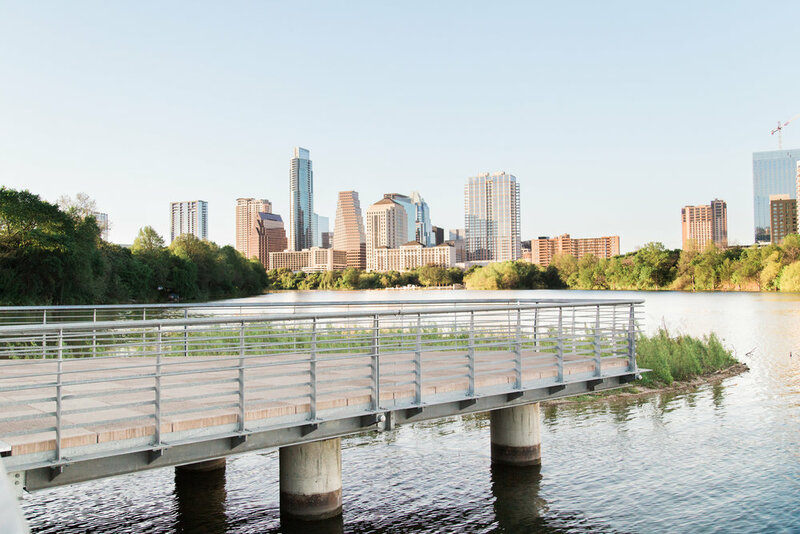 If you're ever back in Austin, I'd love to show you more of this beautiful city! If you're considering booking a proposal session with McKenzie Coronado Photography, I urge you to read a review that Cong wrote about his experience below. I know that proposals are already full of nerves and adrenaline, so I try to make the moment as care-free and relaxed as possible for my soon-to-be grooms! 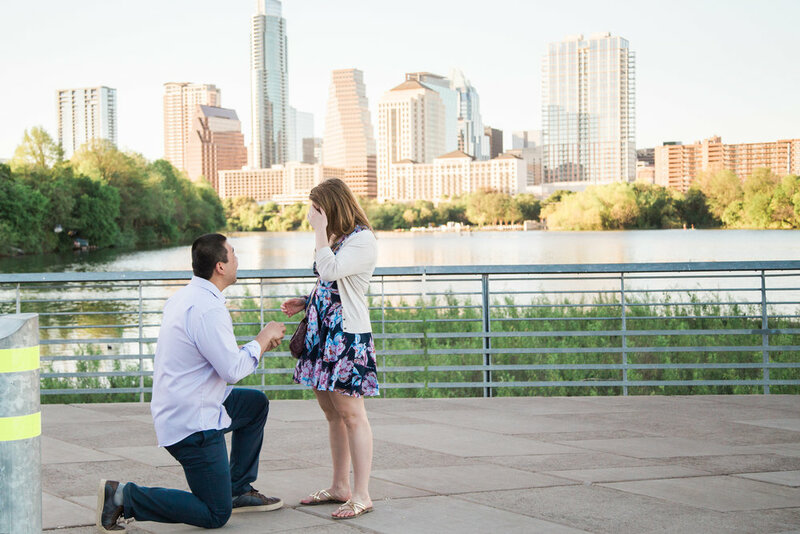 "After careful consideration, I decided to propose to my girlfriend in Austin. However, I'd never been to the city before, and we were only there for a three-day vacation. After doing some research (mainly Google), I found McKenzie as a top recommendation. I contacted her to take our engagement/proposal photos. I really didn't have any ideas other than a few recommendations from friends. However, given McKenzie's background, she was able to suggest several options. She was super engaging and really dedicated herself to this challenge. She even went to all her suggested places and took photos of them to send to me. In the end, I choose to propose at the boardwalk. For the big day, we decided to meet at the last pier at 7:15pm. She had suggested this location because it overlooked the Austin skyline. We contacted each other throughout the day, and she was there way before our scheduled time to prepare for our arrival. She was great at blending in as a tourist taking pictures - my girlfriend at the time had no idea. When the big moment arrived, she was there to capture all of it. A few moment after I proposed, she came over, and took more pictures of us in various ways. A few hours later, she had sent five great pictures to pass along to our families, and about a week later, the other pictures arrived via email. I am really glad that I choose McKenzie to capture our special moment. The pictures turned out great! She was a true professional from start to finish. " You guys, I have never been so excited for two strangers than I was on this day. Eliott and Katie were visiting Austin for a few days and I was contacted by one of our mutual friends that Eliott was going to pop the question while in town! After a few emails and texts exchanged between their friend, me, and Eliott, we had a game plan! I had never met or seen them before, so I asked their friend to text me pictures of them so I would know who to look for. I used all of my secret proposal tips for a smooth proposal process and waited for them to arrive to the desired spot. Katie thought that they were going for a bicycle cruise around Town Lake (I still will never be able to call it Lady Bird Lake, sorry.) Little did she know, her soon-to-be husband had been plotting the ultimate surprise! They drove past me on their bikes and parked them at an overlook to enjoy the view. I was hiding behind a tree because I didn't want my long paparazzi lens to blow my cover! I was trying to get a few shots of them before the proposal, but Katie kept looking my way, so I had to keep turning around and hiding my camera so she wouldn't become suspicious! There was a family that had two dogs near the spot he was going to propose, and when Katie kneeled down to pet them, I saw Eliott look my way and give me a signal that he was about to pop the question. They got to the overlook with the water and skyline in the background, and Eliott dropped to one knee. From a far, I heard Katie squeal and her reaction was priceless! I have never seen somebody more surprised than she was- the best way reaction for a proposal! After a few minutes of letting them talk, hug, and kiss, I came out of the trees and walked towards them. Once Katie saw me she said, "Is this really happening?!" Afterwards we took a few pictures of them together and I was in photographer Heaven! There was no posing or directing them with our mini photoshoot afterwards because their happiness and excitement spoke for itself! I loved capturing the real life conversation of Katie asking Eliott all of the questions she wanted to know the answers to. "So does anyone else know about this?" "When did you get the ring?!" "Does ___ know?!" and then in between questions she kept saying, "Is this happening?! How did you do this?!" Eliott, you did so good at surprising your bride-to-be and she is such a lucky girl! You two are such a precious couple and capturing your pure joy and excitement gave me such second-hand happiness! Everyone deserves to find a love like yours and I wish you guys many years of happiness! When Gabi's best friend reached out to me about capturing Gabi and her boyfriend getting engaged, I was beyond excited! (Also, shout out to having a best friend that knows what you want. A little Pinterest stalking may have been involved too. Can you blame us??) When she reached out to me, I wasn't publicly offering proposals but said that I would of course do it because but they are some of my most memorable photo shoots. There's nothing quite like the adrenaline rush you get while you're hiding out and waiting to witness two people saying "yes" to each other for the rest of their lives. It is such a special and raw moment and I feel honored to be able to capture it for the couple so that they can savor this moment for years to come. After a lot of thought and prayer, I am NOW OFFERING PROPOSAL SESSIONS! I am so excited about this new opportunity and I am eager to meet more couples as they share this amazing moment together. Zach and I were looking at the forecast all week because there was a high chance of rain. He had a back-up plan, but we REALLY wanted plan A to work. So, we took a chance! When we arrived at the Long Center, the sun was shining and the weather was perfect! When Gabi's mom texted Zach to say that they had arrived, we got in our spots and waited anxiously. As we were waiting, the temperature dropped about 10 degrees, the wind picked up, and dark clouds rolled in. The rain was seriously minutes away, and I looked up into the sky and pleaded with God. It's not my proudest moment, but I laughed to myself and said out loud, "Lord, I'm sorry, but you have to hold the rain off right now. You can let it rain the minute after he gets down on one knee, but not now." A minute later, Zach gave me the signal that Gabi was walking up the stairs and I said again, "Here we go. Not now, Lord." Gabi walked up the stairs and to her surprise, saw her boyfriend waiting for her at the top. Zach was supposed to be "working" out of town, so seeing his face was a HUGE surprise for Gabi. They greeted each other and he took her hand and went on a little walk to the spot that he would ask her to be his wife. You can tell from the images that Gabi was completely caught off guard, but so overjoyed! They enjoyed a few minutes together before I introduced myself and got a few pictures of them as an ENGAGED couple! We had about five minutes together and then the rain started. I looked up at the sky, laughed, and felt God winking at me. Gabi and Zach, I wish you a life full of love and laughter! Thank you for letting me capture this moment for you guys. I hope you always feel the joy that you felt on this day! 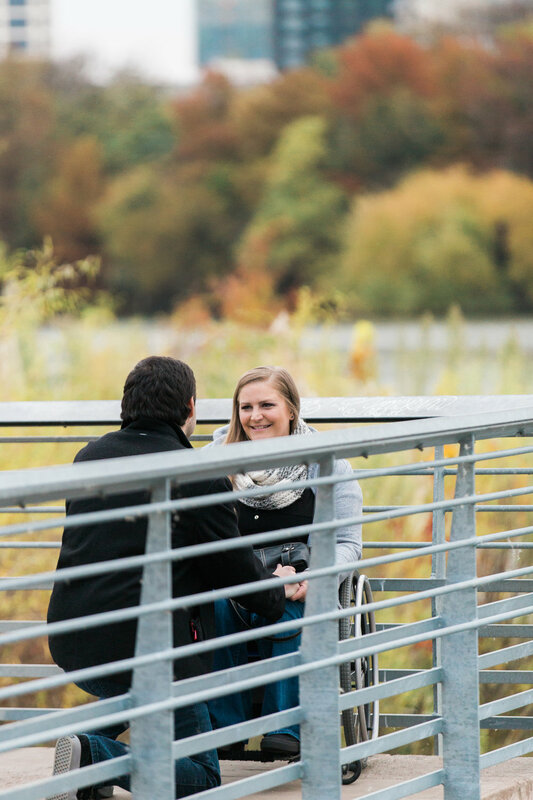 If you're wanting to book a proposal session with me, let me know by going to the contact tab above! I'd love to give you more information and get to know you!